A warm welcome to the Backer Dirks Website! Genealogy: If you are interested in the genealogy of the Backer Dirks, Elvy and related families then please go back to the top of this website and click on the link called "Detailed family genealogy". This will take you to all the information about births, baptisms, marriages, children, professions, deaths, etc. Stories and pictures: If you want to read some stories about the Backer Dirks and Elvy ancestors then please click on the links listed below. Alternatively, click on this icon to see a overview of the entire family tree from where you can also click on individuals to read their stories. How confusing dates can be! Did you know that prior to 1752 in Great Britain, dates between 1st January and 24th March were recorded as belonging to the previous year? This chart shows the growth in population of the descendants of Johan Jacobsz Kuchenbecker, our earliest known direct ancestor. Johan was born around 1570, he married a girl called Anna, and in 1603 they had a son. After a restless but inspirational night, they named him Jacob Johannsen, which means Jacob son of Johan. Young Jacob married a girl of whom we have no details, except that Jacob was obviously extremely fond of her because he wasted no time in siring eleven children with her. We descend from the ninth child, Dirck Jacobs. Jan Dam Dirks, who in 1813 changed his name to Jan Dam Backer Dirks, was the great-great-great grandson of Dirck Jacobs. This chart shows the trend in population of people born into the Backer Dirks family. It begins in 1813 when Jan Dam Dirks changed his name to Backer Dirks. He was the first Backer Dirks. We observe an encouraging surge in population in 1825 as the population doubles from 1 to 2 when Jacobus Johannes is born to Jan Dam. This is followed by a calamitous 50% drop in population from 2 to 1 when Jan Dam dies in 1844, leaving his 19 year old son as the only surviving Backer Dirks in the world! For the next 37 years the World holds its breath as the Backer Dirks name teeters on the brink of extinction. In the summer of 1880, unable to stand the suspense any longer, the Good Lord, Creator of Heaven and Earth, leads Anna Maria Clasina Thierens to the now 55 year old Jacobus. Jacobus immediately falls in love with Anna (who wouldn't! She was almost 20 years younger than him...) and they marry. Jacob and Anna have 5 children. Their first child dies in infancy, as does their third. After this precarious start, the Backer Dirks name has steadily grown to its present height. Our branch of the Backer Dirks family descends from the fourth surviving child, Jacobus Johannes Backer Dirks, who was born on a bright mid-Winter's day in 1886. The only other branch of the family descends from Jacobus' elder brother Cornelis Pieter Backer Dirks who was born in 1883. Below is an overview of the Backer Dirks family as it currently stands, built mainly from information in the family history book written by my Pap. Click on any box to see a detailed view. Soon I hope to bring a similar family tree of the Elvy family branch. Click here to see a picture of closely relates families. Note: The above contains only about 600 individuals linked to the Backer Dirks family. If you want to navigate the entire genealogical tree (about 1500 individuals) and see additional photos, details and descriptions please click on the blue link "Detailed family genealogy" at the top of this site. No other family in the world has the name Backer Dirks. Our surname started in 1813 and since then only about 50 people have been born with this surname. Most of them are still alive today. 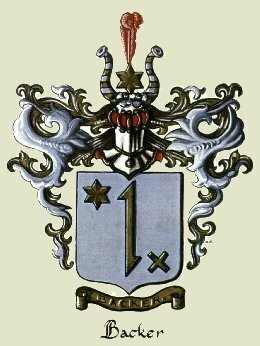 Our earliest direct ancestor we could find traced through the male line is Johan Jacobsz Kuchenbecker from Jever (which is now in Germany). He was born around 1570. Our earliest direct ancestor we could find traced through the male and female line is Jan Thierens who lived in the mid 1400's. That's two generations before Christopher Columbus sailed to America. Our earliest indirect relation (i.e. including links by marriage or siblings) we could find is Arnulf of Metz who lived around 0582 - 0640. We can trace indirect links from our family to the great lineage of mediaeval Frankish Kings, which includes Charlemagne Emperor of the Holy Roman Empire. Our family tree contains around 1500 people. We have relatives in the Netherlands, Germany, England, the United States, Argentina, South Africa, and others...? Neanderthal Man was named after someone in our family tree, Joachim Neander who died on 31 May 1680. We have received numerous honourary titles, distinguished diplomas and other accolades. Our family has published many books and academic articles. Our relatives have frequently been honourary guests at top Universities, including at Harvard and Oxford. There is a large monument in IJmuiden, Netherlands, in honour of one of our most famous ancestors, Justus Dirks. The Dutch Royal Family have popped in for an informal cuppa tea with our relatives at their home. 24/10/01 - a few old pictures added, plus a few more 'did you know' facts. 05/11/01 - photograph added of Karjan Backer Dirks with her husband Harry and son Robin. 06/11/01 - personal web pages of Maurice Backer Dirks added. 04/12/01 - Feuilleton "Uit den Franschen Tijd" added to history section, and counter of visitors added. 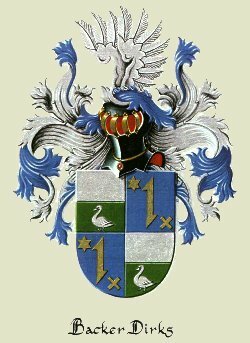 06/01/02 - Introduction of graphical family tree, descriptions of coats of arms, re-organisation of history pages, cloaking of e-mail addresses. 21/01/02 - personal web page Oliver Backer Dirks added. 06/02/02 - Dowry of Margarethe Meins added to history section. 01/03/02 - Story of Jacob Dirks added to history section, and over 100 new Dirks relatives added to the family tree. 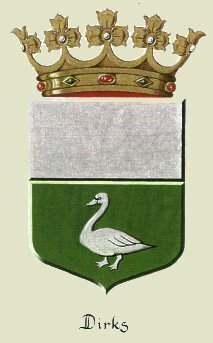 28/04/02 - Genealogy and stories of the Elvy family added (over 500 new individuals). 14/11/02 - Links to Lisbeth's personal website added. 12/02/03 - new hit counter added. 22/02/03 - Backer Dirks and Elvy picture galleries added. 07/09/03 - Michael Nathaniel Backer Dirks added - the latest Backer Dirks! 21/03/04 - New names and new photographs added. 17/08/04 - links to the lineage of Frankish kings (including Charlemagne). 19/10/06 - lots of details and photos of descendants of Lida Clasina Dirks (?-1926). Oh dear, I haven't maintained this list of changes! 19/01/17 - details of Jurjen BD's family added. I hope to put a lot more history on the website, and many more pictures as well. Much of the Backer Dirks history is in Dutch; I will translate this into English when I get the time. Here is a list of people who have contributed to this site. Pap is the Great Historian of the Backer Dirks family and deserves a special mention. Practically all the historical information on this site is thanks to his hard work. I deserve a mention for setting up and maintaining the website. Here too, hundred's of late night hours of fun in front of the computer (fun for me, not the wife). Karjan kindly corrected a few facts, supplied some new information and a sent photograph of her family. Maurice has created his own personal web pages. You can view this by clicking on the 'e-mail addresses and personal web pages' link at the top of this page. Andy Jones for hosting this site free of charge on his hosting service JavaHoster. GenoPro excellent genealogical package which you can download from the Internet. I used this to create the 'Detailed family genealogy' pages.